I've been working on collecting images for this post for quite some time now. 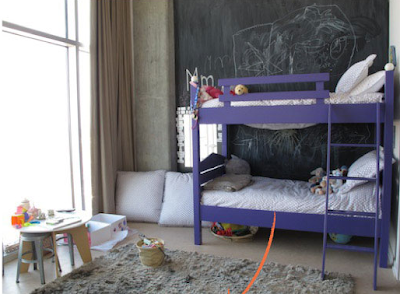 Finally I think I have enough to show you how purple works in almost any style of children's room. Trust me, I used to not be a fan of purple but now I'm digging the soft and sophisticated traits of the color. 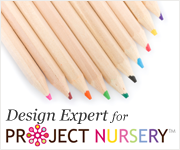 Since it sits opposite of yellow on the color wheel, it has the opposite effect of energetic yellow which is calming. It is also associated with wisdom, dignity, creativity, imagination and spirituality. 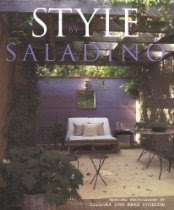 I think my turning point regarding my view of the color came when my mom gave me the book Style Saladino by John Saladino a few years ago when I was taking interior design classes at UCLA. He was one of the first contemporary designers to bring that dusty purple that we all love into mainstream sophisticated adult interiors, mainly pairing it with mediterranean inspired homes, antiques, iron, linen and stone. Since then purple/lavender started popping up in adult and not only children's interiors. Here are a few of my favorite shots of purple rooms. Some are traditional, some eclectic and some modern. Which are your favorites? 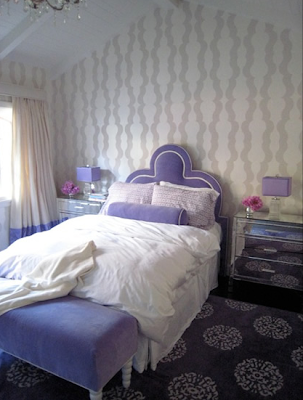 An eclectic girl's room above by Zoldan Interiors, and a more glamorous take on purple below by the same designer with the mirrored dresser and velvet headboard. Soft and simple, the classical pairing of lavender and green designed by Natasha Baradaran. 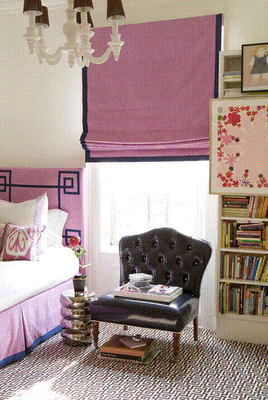 I can't seem to find the designer for this one but saw the photo on Pink Wallpaper (another favorite blog). The carpet makes this room. One of my own client's rooms, again we let the Stark carpet and the Osborne & Little fabric on the windows steal the show. 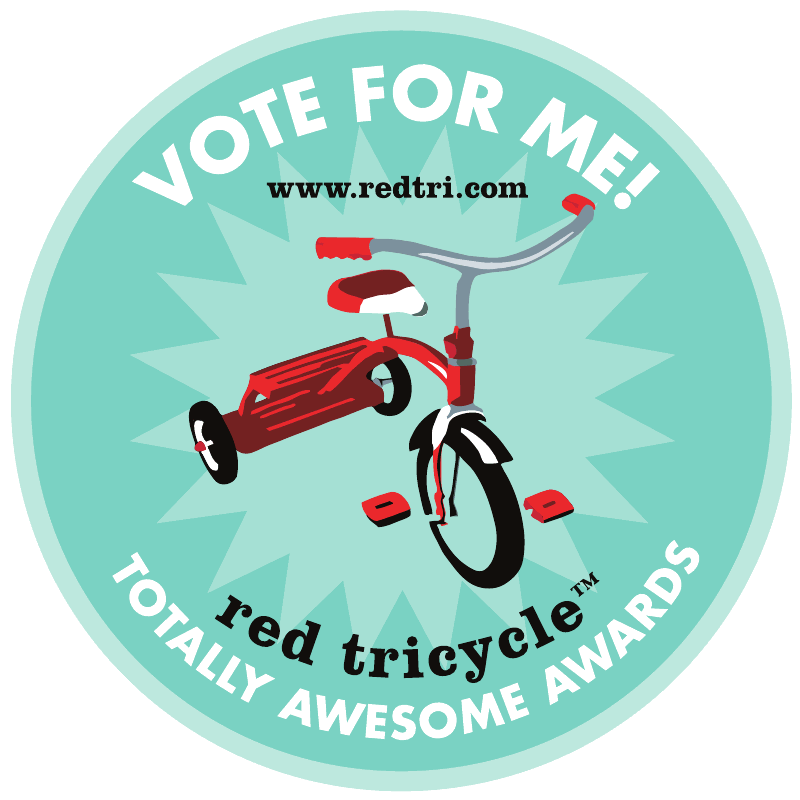 Another design which I'm sure all of you have seen many times already by Amanda Nisbet. (Everyone loves the headboard). 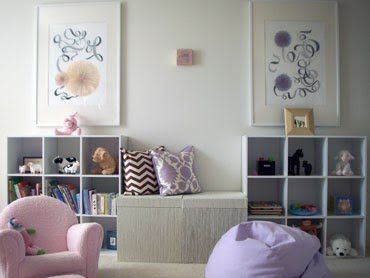 A nursery designed by Lonni Paul for Tiffany Thiessen. This is one of my favorites, designed by Kelly Wearstler. Not much actually purple here besides the bunkbeds, but they make quite the statement. 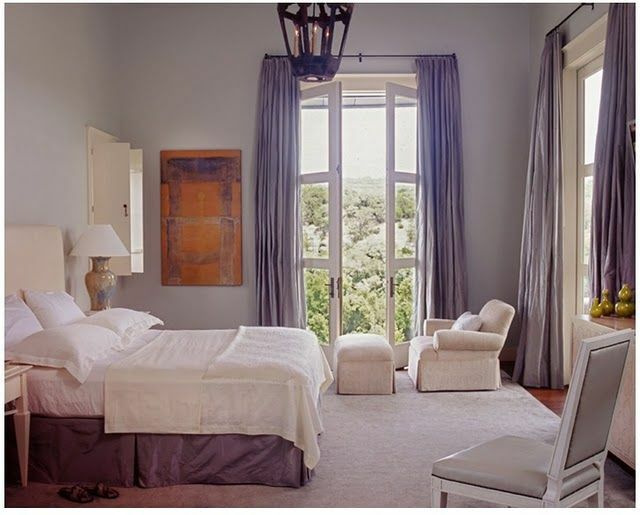 The room was designed by Annette Joseph for Gweneth Paltrow featured on her newsletter Goop. 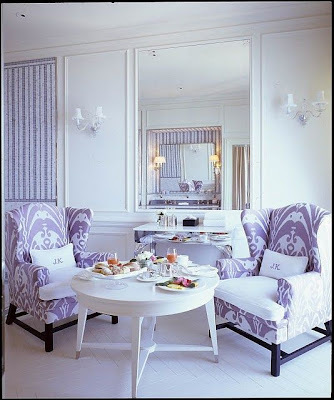 A bold take on lavender with stripes in a room designed by Lucy & Company. 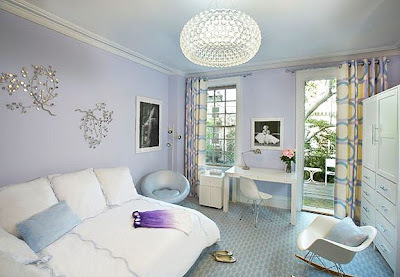 Anything Amanda Nisbet is fabulous, but that Kelly Wearstler room is one of my absolute favorites!! 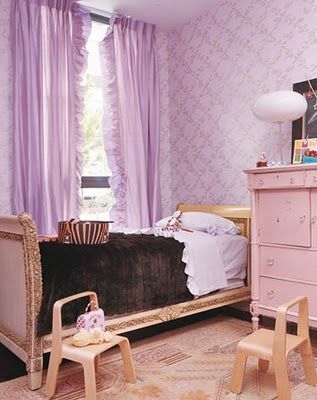 I love using purple for children's rooms. My dining room was purple once. I believe the designer of the room with the purple carpet and twin beds is Laura Stern.